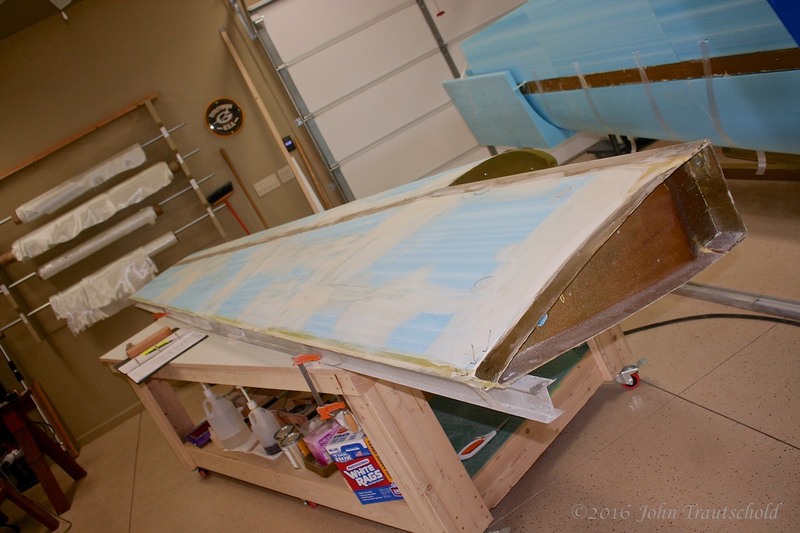 With the left wing fiberglassing complete, I’ve now moved on to the right wing. The process is pretty much identical but I still need to document the process. See below for photos for the right wing. Section 2.2.5 is included here since that short section in the manual is included as part of the upper wing preparation before glassing. Now the layup for the top of the wing is complete. 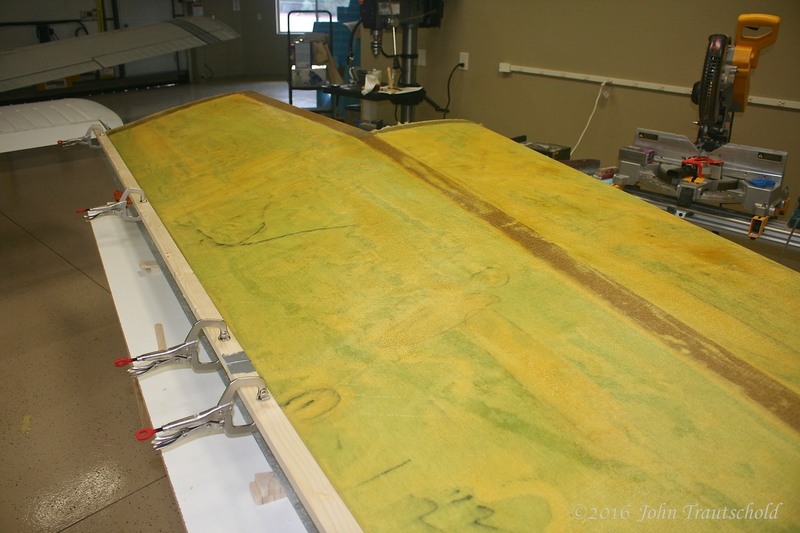 Our entire left wing is now covered with fiberglass and a lot of epoxy. Once it cures I need to finish cutting some access holes for the wing attach bolts. After those holes are cut there’s a bunch of fiberglass and epoxy work that needs to be done to strengthen those openings. More to come! The process begins! That’s my friend Howard in the background who helped with my first major layup. 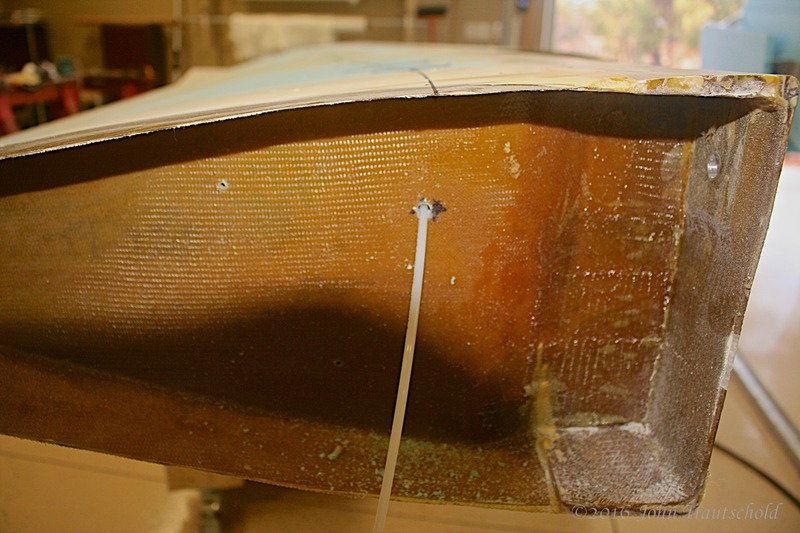 Although it’s hard to see in this photo, there’s a layer of epoxy slurry underneath the fiberglass. The slurry is spread evenly across the entire surface. It helps to fill in any remaining bumps or gaps on the cores and also helps to hold the fiberglass (triax, in this case) to the cores. I used a rubber roller that I originally purchased for tighly sealing wallpaper seams to help work out bubbles and gaps! It actually worked quite nicely, helping to get the fiberglass to lay tightly against the slurry. Our first layup begins. 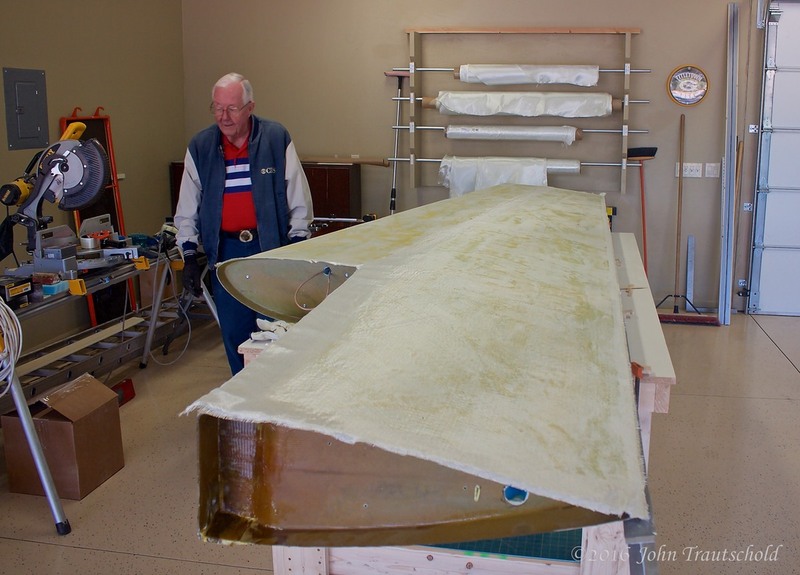 My friend Howard helped to place the fiberglass on the wing in preparation for adding the epoxy. 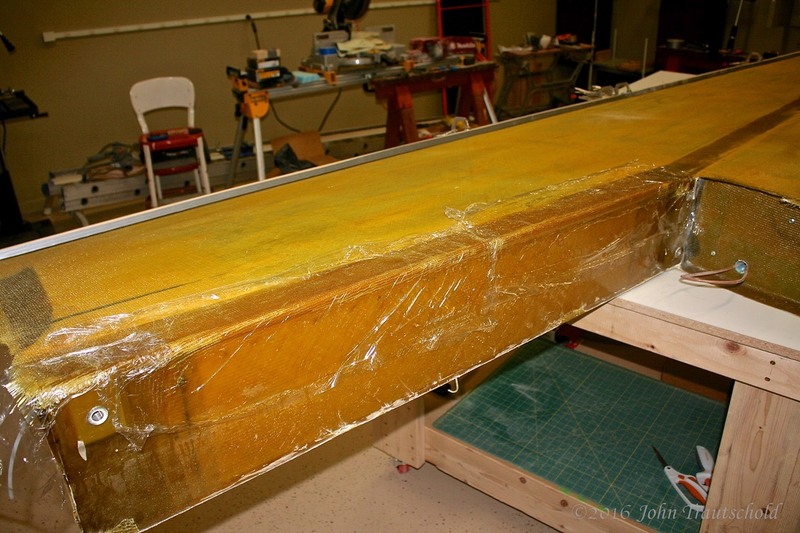 Here's a closeup shot of the fiberglass (Triax) on the bottom of the left wing prior to dousing it with epoxy. Here we see the fiberglass after it’s been impregnated with EZ-Poxy. The final products is an extremely hard and tough surface. There’s still a lot of work to do, however, before this wing is ready for paint. But that process will occur sometime much later. 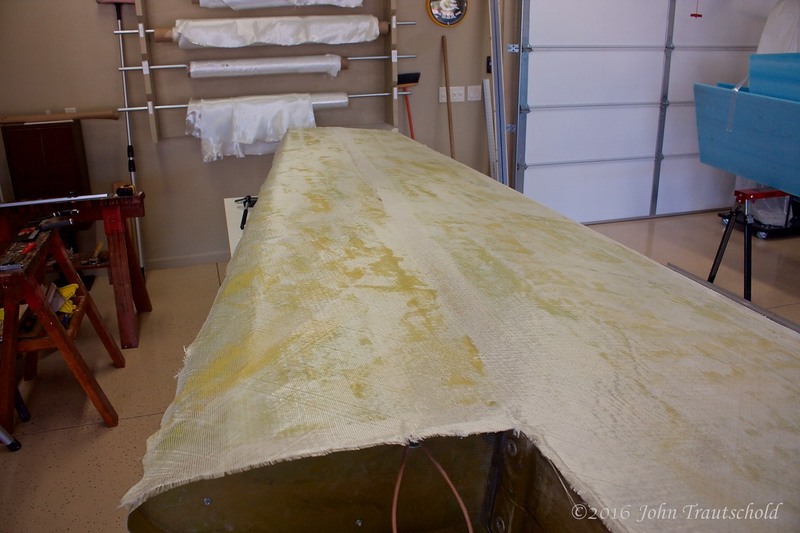 The layup is finished and the epoxy has been mushed into the fiberglass. The wood boards and the clamps at the trailing edge are used to create a nice, tight seam at the edge. This angle gives a better shot of the boards and clamps being used to create that tight trailing edge. You may be wondering what the boards and clamps are for. The factory wants the trailing edge of the wing to come to a sharp edge. The wood boards (which are covered with duct tape on the bottom side so that they will easily release from the epoxy) are clamped down to create that sharp edge. Later, when I epoxy the top side of the wing I’ll clamp the edge once again for that straight, tight fit. 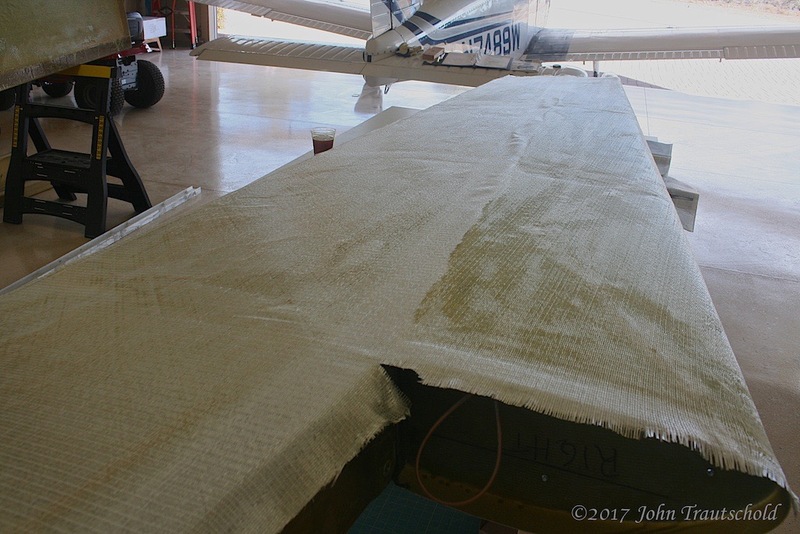 Just like on the bottom side of the wing, we need to fill and sand the top part of the wing to try to get it as smooth as possible. Almost done! The process for the top of the wing is almost identical to the bottom. Filling and sanding … filling and sanding … filling and sanding! Yikes! A very stiff plastic tube is embedded in the top of the wing. Eventually, a stainless steel cable gets placed in this tube and is used for rudder control. If you recall, we needed to embed one of the navigation antennas on the bottom of the wing. On the top we need to embed a run of Nylaflow tubing which will eventually hold a stainless steel cable to be used for rudder control. This is the Nylaflow tubing embedded in a channel cut with a soldering iron before being epoxied in place. Here's where the tubing exits the wing on the inboard side. 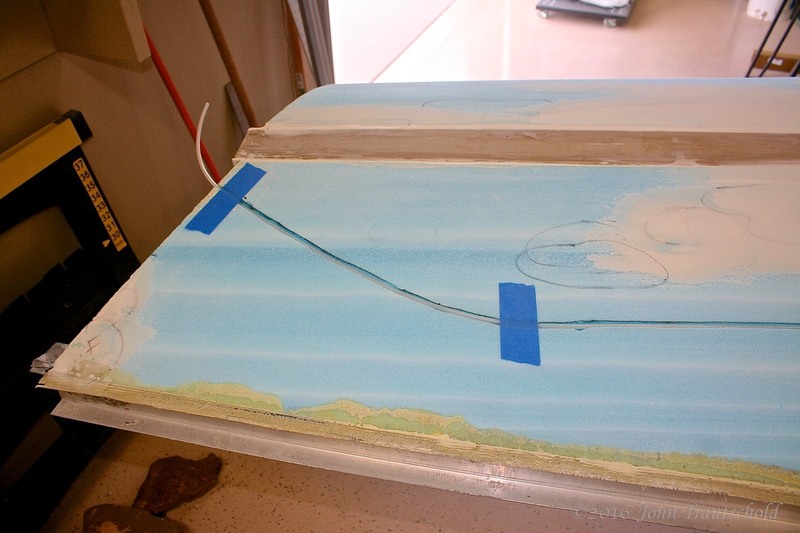 The tubing, and eventually the cable, exits the inboard trailing edge rib, as shown here. Doing the upper side is a bit trickier but I did get it done. Even though you can't see them here, I did end up getting some bumps on this side which I'll have to work out later. Bummer! They popped up overnight while the epoxy cured! 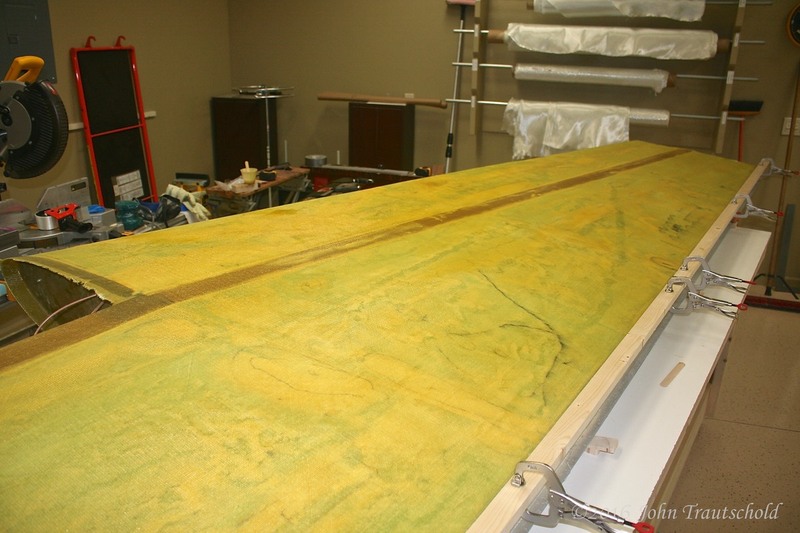 And here’s the completed layup during the curing process. As before, I’m using the long board and clamps to get the trailing edge as tight and straight as possible. This is also the least (easy) chance we have to make sure that the wing is as straight as possible. The epoxy won't stick hard to the plastic wrap, so I use that to hold down the edges during cure so that they don't pull up. 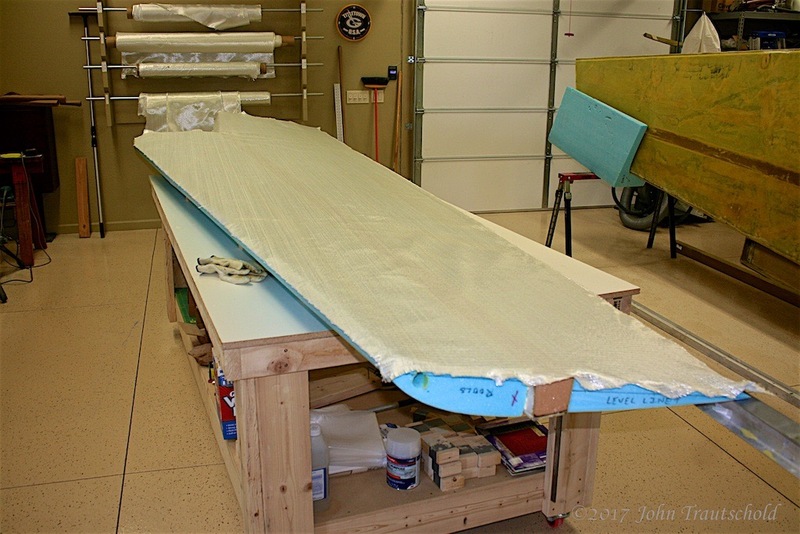 As the caption explains, I’m using some plastic wrap to help hold down the fiberglass over the edges so that it lays flat. 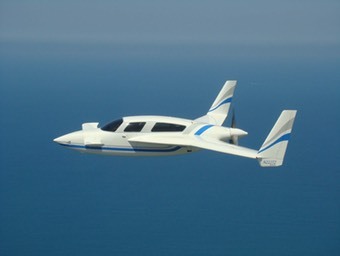 And now, photos for the lower right wing glassing. The procedure for filling, sanding and installing the Nylaflow tubing is identical so I won’t show that here. 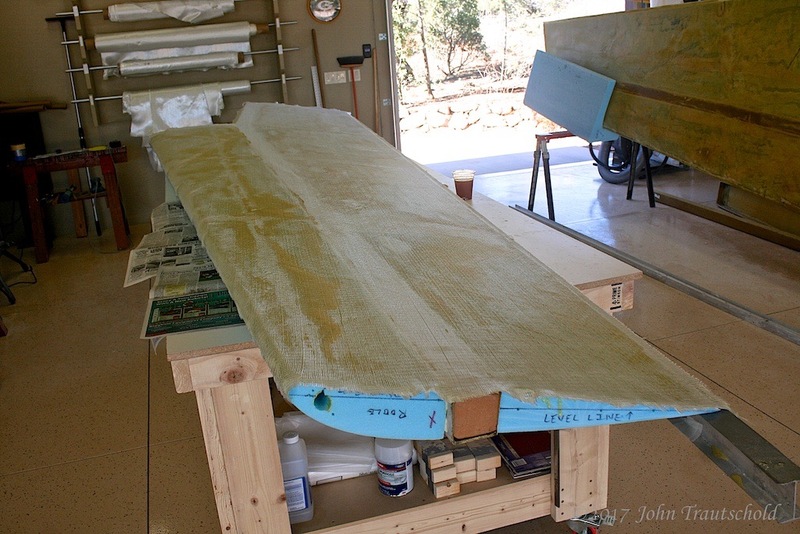 Getting ready to lay down fiberglass - here I've rolled off a section and precut it to size in preparation for gluing. Here's another view from the inboard side of the wing. 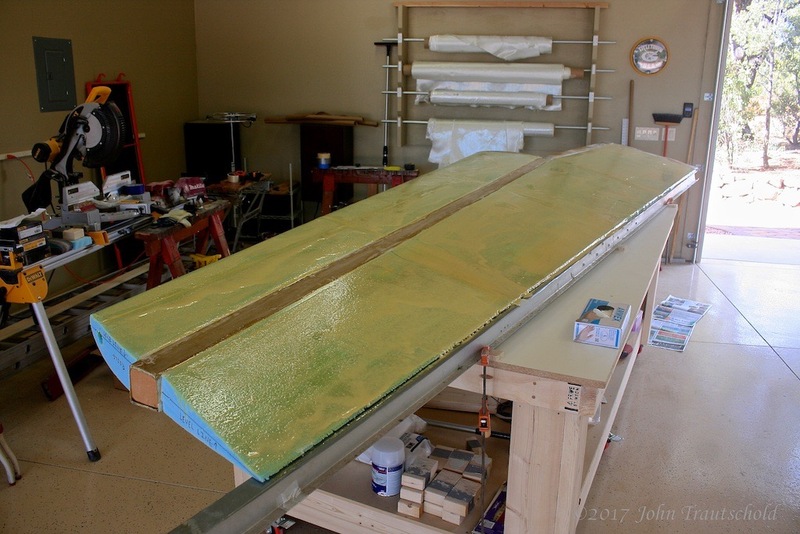 Before laying down the fiberglass for gluing, I apply a slurry - a mixture of epoxy and glass beads. Once this gets tacky we place the fiberglass on top. The slurry holds it in place in preparation for the final application of epoxy. Not only is this stuff sticky, it's also stinky! 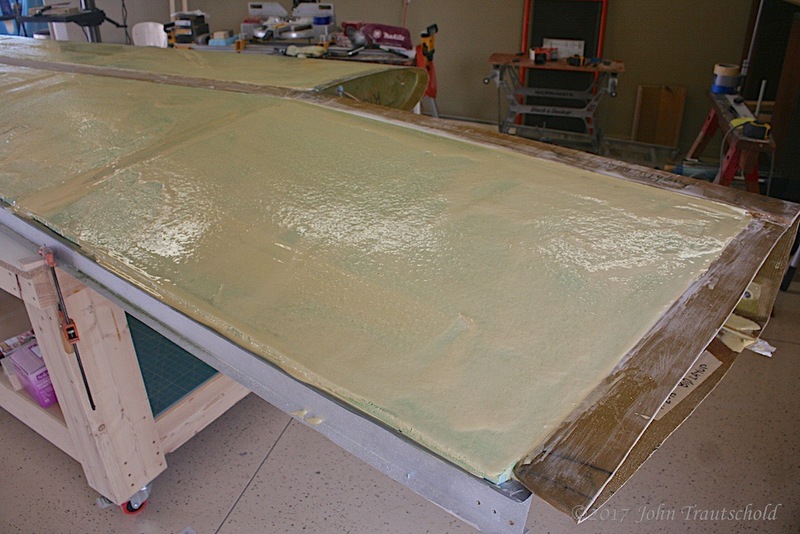 The fiberglass that I precut is now placed on the slurry. We smooth it out by hand as much as possible to eliminate any bubbles, then I use a rubber wallpaper seamer roller to make sure that the glass is nice and tight against the slurry. Here's a view of the layup from the inboard side of the wing. It looks like there are bubbles along the middle of the wing. That's where the spar is and we do not apply slurry to the spar, therefore, there's nothing to hold that cloth down there yet. It'll be nice and tight once everything is glued down. 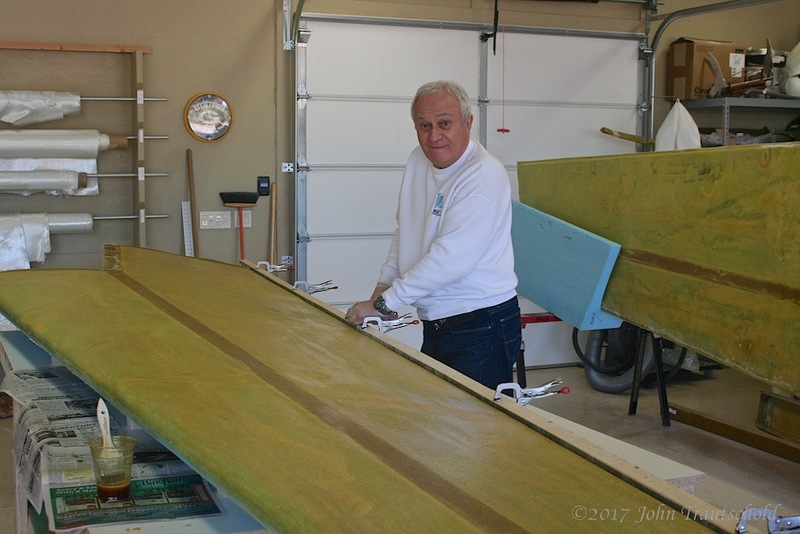 My friend and helper, Howard, caught me in the act of clamping down straight edges along the trailing edge of the wing. If you look at the left wing in the back right you can see how the trailing edge on that wing has an indentation to it. That's what I'm creating here. 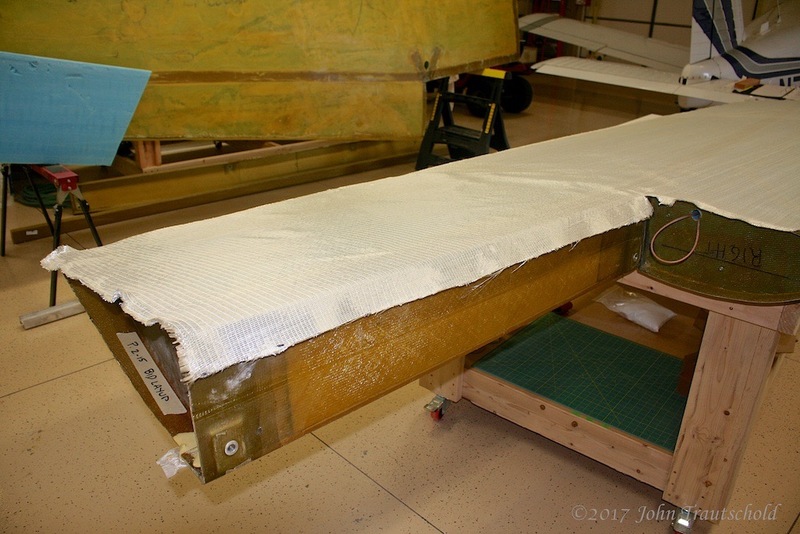 You can also see here that the glue has been applied and that there are no more bubbles, or loose spots down the center of the wing where the spar is. Except for curing, this side of the right wing is now finished! 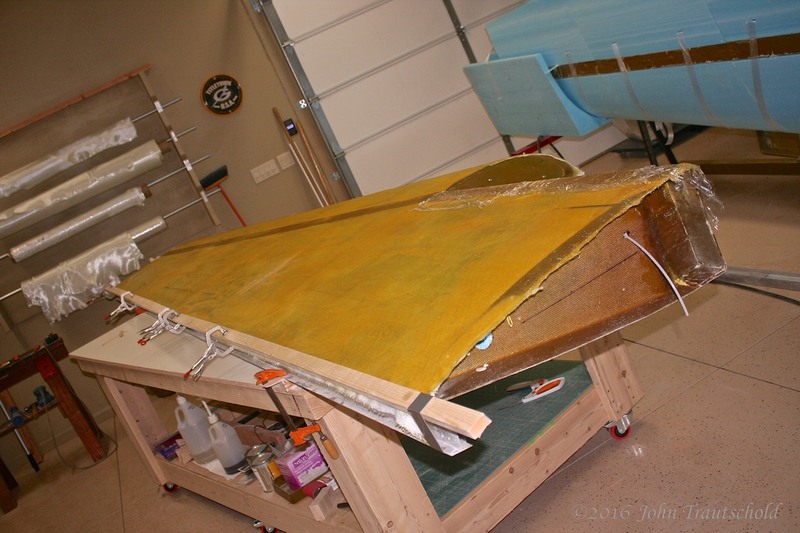 The final step is to cut holes into these newly fiberglassed wings for access to the wing attach bolt holes! See the next page for those photos and descriptions.